As you all know, I went to the World Natural Hair Show this past weekend. I had tons of fun meeting people and just overall absorbing the environment. If you are an avid reader of this blog, you also know that I spoke about why I will not be participating in anymore "hair vitamin" challenges. If you haven't read that post you may be a little lost right now, but the topic I am about to discuss and the topic of that post have many things in common. I love to blog and write in general, it is simply my passion. When I connected with the natural hair community, I felt as if I found my calling. Somewhere along the line of helping myself grow to love the real me has also helped you all as well, and that's my goal! My issue occurs when I see companies take advantage of people like us. Those who are excited about our community and excited to unlock hidden features within ourselves. They take advantage of us through greed. Companies are aware of how big the natural hair industry is right now, and in order to stay afloat, they feel as if they need to trick us into purchasing their highly-priced products. But there are others that "fake" the innocence. They throw mineral oil in a product but slap "all-natural" on the label. I can't count how many times I've gotten emails about reviewing a product that claims to be all-natural, but clearly isn't and how many times I've been asked to participate in a challenge just to make my hair grow. We are TRULY missing the point here. 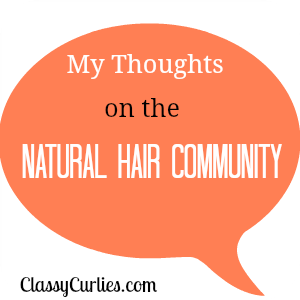 I've always saw the natural hair community as just that...natural. Not only in our hair, but overall lifestyle and inner beauty. If long hair and experiencing crazy side effects from "hair vitamins" is more important than health...that's a serious issue and we are getting sucked into the hole. Yes, I had a wonderful time, but it was obvious, out of all of the vendors who was genuinely interested in the customer's best interest and who was there just for the money and to take advantage. I have no problem supporting those who care in the form of product reviews,promotion, whatever it may be because that's my job as a blogger (well at least that's how I feel).